With student loan debt at an all-time high and the cost of tuition still rising, it seems that no one these days can afford a college education. However, if you do your homework, fill out the applications and do some networking, you might be one of the lucky ones. Consider it a prep course for college, which you will now be able to attend using these tips. The first step in the financial aid process is also the single most important one: filling out your Free Application for Federal Student Aid (FAFSA). To do so, you will need last year’s tax return for yourself and your parents, a current bank statement, and information on your total assets as well as personal identifying information like your Social Security number and driver’s license number. Basically, the form helps you describe your family’s finances in detail, taking into account income, assets, debts, divorce, other dependents and siblings already in college. From these numbers you will be given a magical number called your Expected Family Contribution (EFC) which states how much your parents could conceivably pay towards your education. This is neither the amount they will pay nor the amount that you will pay; that number is determined by the financial aid office of each institution. Each institution to which you submit financial information will provide you a financial aid package. This can include grants, scholarships, work study, and various types of loans. The best financial aid is the kind that you don’t have to pay back, such as grants and scholarships. Grants are usually need-based. The federal government allots a fixed amount of funding to colleges each year, who then distribute it to students who meet the federal guidelines. It pays to apply for financial aid early so you don’t miss out. Your state and the college of your choice may also offer their own grants. The work-study program, although not free money, has definite advantages if you qualify for it. If you are awarded $2,000 in work-study, you must find a job on campus designated for work-study, and the amount offered is the maximum you can earn each year through that job. While working part-time may seem like a chore, you will make connections, gain workplace experience and manage your time better by balancing school and work. It has tax benefits as well; wages earned through work-study count as financial aid, not income, for next year’s financial aid application. It also pays to look everywhere for scholarships. Your parents’ workplaces may offer scholarships for children of their employees. Local organizations such as Rotary International may also offer scholarships and your chances will be better because there are fewer applicants for a local scholarship. At your institution you should ask the financial aid office how to find and apply for scholarships within the school. If you intend to enter the military after graduation, you have many options for education, training and service. In the Reserve Officers’ Training Corps (ROTC) you can get up to a full four-year scholarship and enter the service as an officer after completing a degree. The Community College of the Air Force provides two-year programs to their members, combining civilian and military course work. All branches of the service offer tuition assistance for courses taken while off duty. Low income students may receive benefits from the Workforce Investment Act. The law provides education and job training opportunities to disadvantaged youths, unemployed adults, veterans and those with disabilities. A local Workforce Investment Board allocates federal funds. You can find the board nearest you through the US Department of Labor website. If your parents can start financially preparing early, or if you have a large network of friends and family willing to help you out, Upromise may have substantial reward for you. Upromise is a free service that gives rebates when you shop at certain stores or buy certain brands. Amounts earned may be small but add up over time, and the effects multiply if your friends and family sign up to support your account. 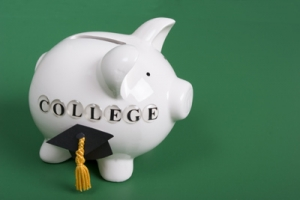 You can even link a 529 college savings account and the rebates will automatically transfer. The company behind Upromise offers another program that allows friends and relatives to make gift contributions to a child’s college fund. Instead of putting cash in a birthday card and mailing it to the future college student, they can send it directly to a 529 fund. Parents can play a supporting role in paying for their child’s college, although they should not be taking the lead and taking on a second mortgage or raiding their 401(k). For parents who plan ahead, a 529 plan is an account to help save money for future education expenses. Contributions to the account are placed in investment portfolios and funds are withdrawn as needed for college or other post-secondary education. Grandparents can set up 529 plans as well, and some allow third-party contributions. If a child enters college and the financial aid offered doesn’t cover all costs, parents can take out a Parent PLUS Loan. These loans have a fixed rate and are not need-based. There is no prepayment penalty, so parents can make payments during their child’s college years or defer payments until graduation. Parents take out a new loan for each school year; the loans can be paid off separately or consolidated into one lower monthly payment. The Parent PLUS Loan is intended as a supplemental loan; students should use all scholarship resources and federal student loans first. In short, the financial aid office is your first stop to help pay for college, but it’s not a one-stop shop. Financial help can come from unexpected sources if you research your options and seek out opportunities for yourself. Should You Loan Money to Family or Friends? Great post. You have sorted out every possible places to get for college study. The study cost of colleges has become sky high in recent days. I think, looking for scholarships in the institution you are studying in, is the best place to get college money. Other tips are also appreciated. Great posts. Having put two girls through college I have used all of these and I can offer the possibility for two other tips. 1. If you are a single parent and don’t have a state appointed child support order, get one. A legal child support support order will get you a few more state grants, depending on the state you live in. I got $1750.00 more of grant money (money that does not need to be paid back) for each daughter. And hey every dollar counts. There is grant money avaiable for children who have domestic violence pasts also. 2. Obscure scholarships. There are many out of the ordinary scholarships at there. Thousands hit the Internet every year. Most only require a written essay on the topic at hand and some can be as simple as a photo with a caption. Between my two girls, they got a combined total of over $7000.00. enter as many as you can. My oldest got a $500.00 scholarship for a essay on the importance of dog oral hygiene. An extremely informative and useful post. Upromise sounds a really good service and I would recommend my frds who are financially struggling to research more about the service. Looking forward for more helpful posts. So much has been said about student loans that it will cause ten times more catastrophe compared to what the housing bubble has caused us back in 2008 but it seems like there’s not much reforms being done to remedy the impending burst of this balloon.